to be a Good Sam Park! Welcome to Tawas River RV Park! If you're looking for the perfect spot to base your 5th wheel, travel trailer or motorhome in the Great Lakes region, your search is over! Offering super-competitive seasonal and annual rates, our cozy RV park is ideal for your mobile vacation home. Come join our welcoming community today! While our prime season runs from May 1st through Sept. 30th, there are plenty of off-season activities too. Our annual guests enjoy winter fishing, snowmobiling, hunting, cross-country skiing and more. Our fantastic Annual Rates allow you to park your RV all year round, visiting as much or as little as you please. Unlike many other Great Lakes RV parks, our restrooms, showers & laundry are fully operational year-round. For those looking for in-season fun only, you won't believe our excellent Seasonal Rates. There's no more economical way to base your RV near Lake Huron, making Tawas River RV Park the perfect spot for your summer vacation getaway. Located directly on the banks of the Tawas River, and just 1/2 mile from the beautiful beaches of Lake Huron, you will love our welcoming community. From great fishing right here in the park, to endless Lake Huron attractions, we’re your Tawas City RV destination for year-round family fun. Our inviting Lake Huron RV park is nestled in the trees, with the trout-rich Tawas River running right through. Fish directly from our shores, or launch your canoe, kayak or small boat and paddle out onto Lake Huron from here! 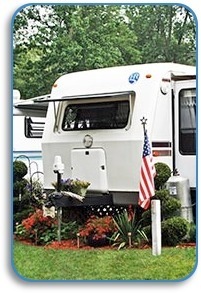 RV parks near Tawas City, MI enjoy the benefits of a prime RV recreation destination. Tawas River RV Park is tucked into its own private riverfront enclave just outside downtown. Only 1/2 mile from Lake Huron, our guests enjoy all the benefits of this great resort area, while relaxing in the peace and quiet of the country. Whether you’re into beach-combing, golf, scenic tours, swimming or just relaxing by the river, we offer a memorable Eastern Michigan RV vacation experience your whole family will enjoy. Our cozy Tawas City RV park has everything you’ll need for a perfect RV holiday. We're close to shopping, museums, restaurants, and outdoor adventure activities of all kinds. Tawas City is the perfect Lake Huron RV vacation destination. Visitors to Tawas City, Michigan enjoy all sorts of year-round pastimes, blue sky, clean air — and magnificent Lake Huron for exciting activities to suit every interest. 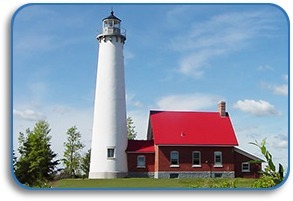 RVing in Tawas City provides opportunities for lighthouse tours, hiking, bird-watching, biking or just relaxing in the beauty that abounds in this outdoor recreation paradise. Tawas River Trout Fishing... Right Here! 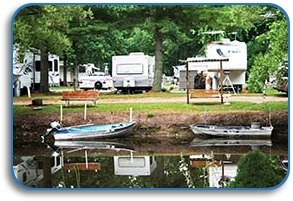 Tawas River RV Park offers a waterfront Eastern MI RV camping experience that’s hard to beat. With the Tawas River running right through the park, you can fish or launch your canoe, kayak or small boat right from our shoreline. The river runs right out into Lake Huron, so you can start your Tawas City boating adventure right here in the park! Fantastic fishing is everywhere at Tawas River RV! Want to really get out on the lake? There are tons of Lake Huron charter boats to choose from. Whether you want to fish, sightsee, enjoy a sailing or dinner cruise, or take a fantastic day trip to the Charity Island Lighthouse, your Tawas City boating choices are endless. Prefer to bring your own boat along? No problem, since you can launch any size boat right nearby, directly on Lake Huron. If shopping is your thing, RV camping in Tawas City offers that too. Every type of shopping and service is available within easy driving distance. You can also enjoy casual or fine dining at one of the many area restaurants. A stroll through downtown Tawas City, right along the shores of Lake Huron, will uncover something of interest to everyone in the family. Tawas River RV Park is the perfect home base for your Tawas City RV camping vacation. Contact us soon to make your reservation and to learn more about our welcoming Eastern Michigan RV park.